Clive has just returned from a successful mini tour in Norway! The aim of the acoustic concerts was to promote the forthcoming Norwegian production of 'Alchemy' in May 2017, as well as Clive's new musical, 'King's Ransom'. During the shows in Mysen, Oslo and Saetre, Clive was accompanied by the original Caamora soprano, Gemma Louise Edwards, and the cast of 'Alchemy' in Norway, including Eirikur Hauksson (Magic Pie), Elisabeth Ellingsen, Harriet Müller-Tyl, Christine Ekeberg, Lars Helge Throndsen, Hans Andreas Brandal, Finn Mathisen and the instrumentalists (known from the Norwegian progressive rock band, The Windmill): Morten Clason (flute), Stig Andre Clason (guitar) and Arnfinn Isaksen (bass). 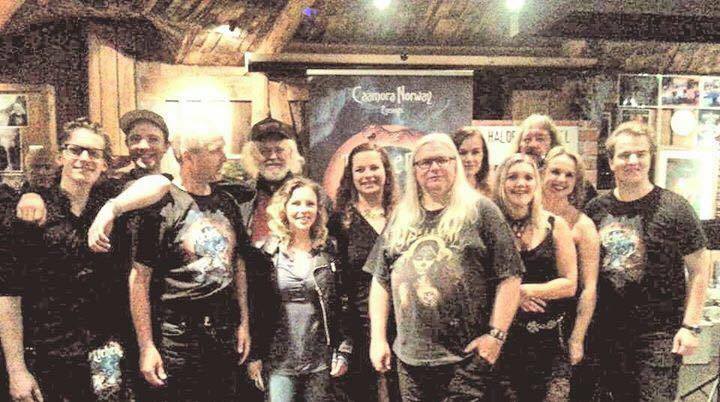 Clive: "A massive thank you to Morten Clason and all the wonderful people involved in Caamora Norway who made this visit so enjoyable and so successful! Thank you to all the terrific singers and musicians who took part. I can see the production developing every day! I also must thank all you lovely people who contributed towards the sponsorship of 'Kings Ransom' - that was a wonderful surprise and very much appreciated! What a great weekend!" More Pendragon Shows in 2016! 'The Fire and the Quest 2': Cheltenham 2017! Clive Nolan and the Caamora Theatre Company will return to the Cheltenham Playhouse for the second edition of “The Fire and the Quest”! 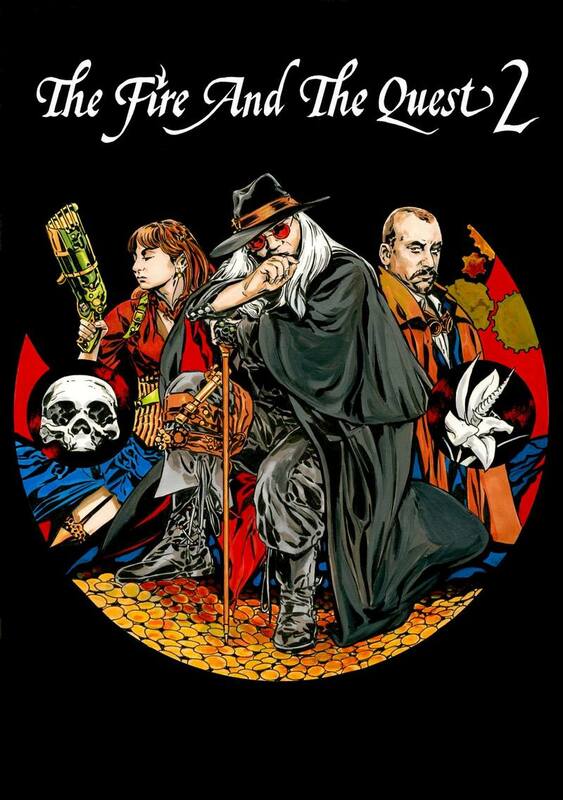 During the mini festival the audience will be able to see two of Clive’s musicals: ‘Alchemy’ and ‘King’s Ransom’, being the next adventure of Professor King and his companions. 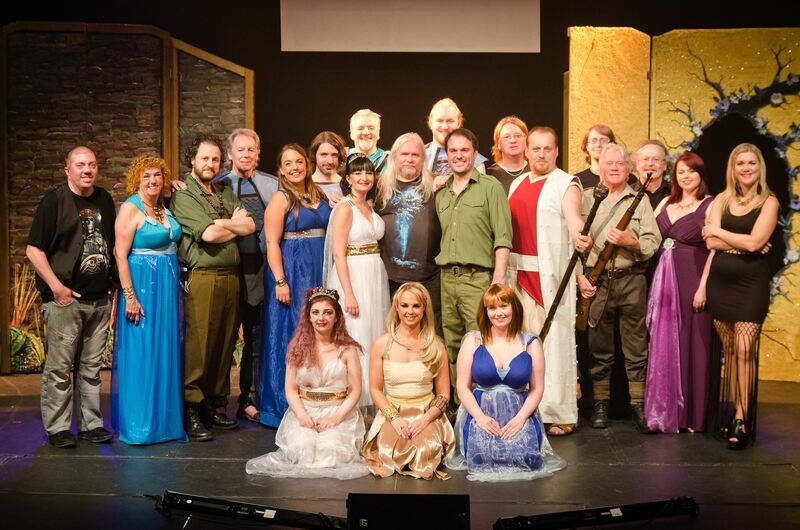 'The Fire and the Quest 2' will take place at the Cheltenham Playhouse at the very start of September 2017, and will be a similar format to the one we did in 2015. There will also be some 'extra features' including 'The Victorian Seance' which will take place later on the Friday (where Ross Andrews will be taking us through some of the tricks of the trade that mediums used to use to 'perform' their communications with the spirit world (£15)). This should a lot of fun! Also for some there will be an option to attend the final dress rehearsal (on Thursday August 31st) of 'King's Ransom' introduced by Clive - This will be a limited number. Please be aware that this rehearsal may consist of stops and starts, as well as the more noticeable presence of cameras and crew. Then there is of course the much enjoyed 'after-party' to round off the weekend. 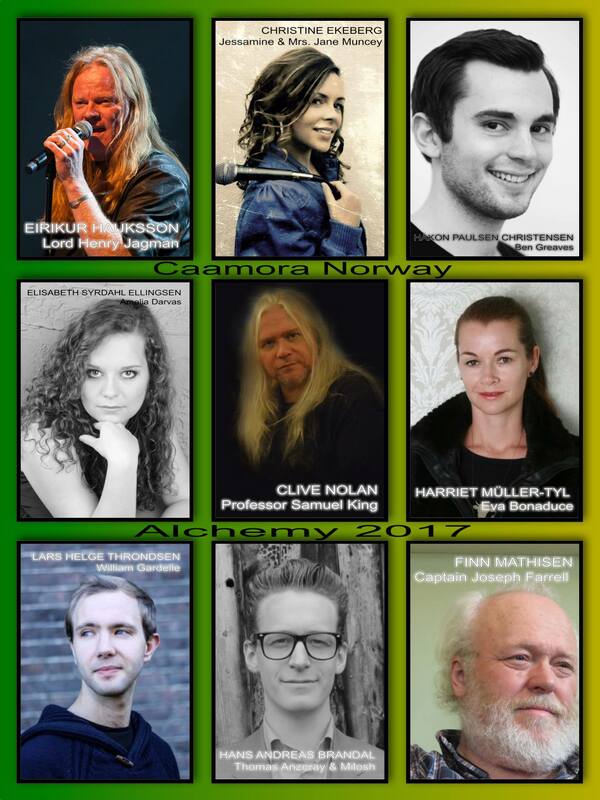 CAAMORA NORWAY: CAST OF 'ALCHEMY' 2017! There are three shows of ‘Alchemy’ scheduled for May 2017 in Norway. The cast has now been confirmed and the rehearsals have begun. The shows will feature Clive Nolan as Professor King, Elisabeth Syrdahl Ellingsen as Amelia Darvas, Eirikur Hauksson as Lord Henry Jagman, Harriet Müller-Tyl as Eva Bonaduce, Lars Helge Throndsen as William Gardelle, Håkon Paulsen Christensen as Greaves, Christine Ekeberg as Jessamine and Mrs Muncey, Hans Andreas Brandal as Thomas Anzeray and Milosh and Finn Mathisenas Captain Farrell. More details will be revealed soon! Clive: "Three more 'She' shows are completed, and I want to send my congratulations to everyone involved. It was a fantastic production which really brought the story to life. As I watched each show, I quite literally forgot I had written it, and got sucked into the adventure that unfolded before me. I could wax lyrical about each and everyone one of you... Mark Westwood tussling with his mixing desk like Spock trying to prevent the Enterprise computer from closing down... Iain David Richardson and tightly run 'prop regime'... Alec Morris bringing such great atmosphere with his lighting... Magdalena Grabias furiously spreading the word across the internet, and then diving into the foyer to force people to buy every piece of merchandise available... Dylan stepping up for stage manager...The amazing Natalie Barnett and Caron Morgan who managed to juggle babies and still have the scenery and costumes looking brilliant... The much welcomed nutritional support provided by Maggi Lewis... The chorus (Alexander White, Ethan Barnett, Ron Milsom, Colin Greene, Ollie West, Joy-Amy Wigman, Katie East and the 'dancy' Emily Frechter) offering such a wonderful variety of character and flavour... Verity Smith turning a 'handmaiden' into a fully formed central character.... Ross Andrews threading his high priest through the story, and gently manoeuvring people into the right places... Gemma Louise Edwards offering such a vibrant and sympathetic Ustane... the wonderful Chris Lewis and and the range that defies testicles... The romantic Robbie Gardner who can't wait to get undressed on stage... and then there is the star of the show, Victoria Bolley, who has truly grasped and owned the role of Ayesha - she may be little, but there was no doubt she had to be obeyed!